My friend “S” treated me to a day of fun to celebrate my upcoming birthday. First up were the wonderful gifts she bought me. “Open this one first”, she said handing me a brightly wrapped box. Inside were six sweet Boopie glasses. Aren’t they so cute? I just had to play a little with them. 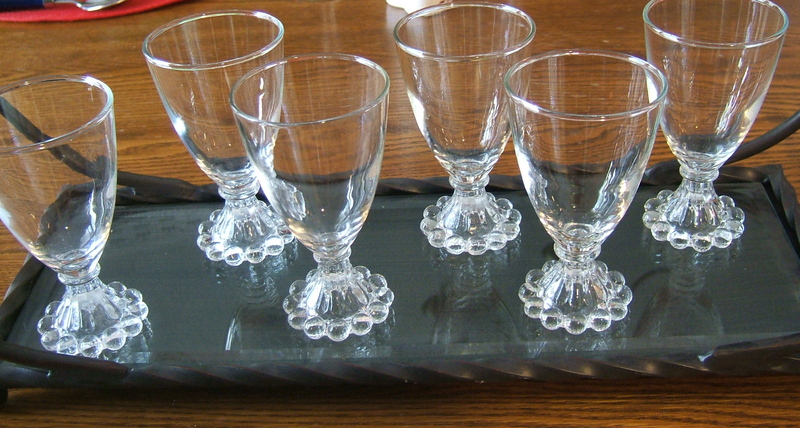 Here they are on my Willowhouse Galveston Collection Tray. Oh by the way, this tray is now on sale for about 1/3 of what I paid for it. That’s what happens when you pay retail! I love how the Boopies look on this tray. 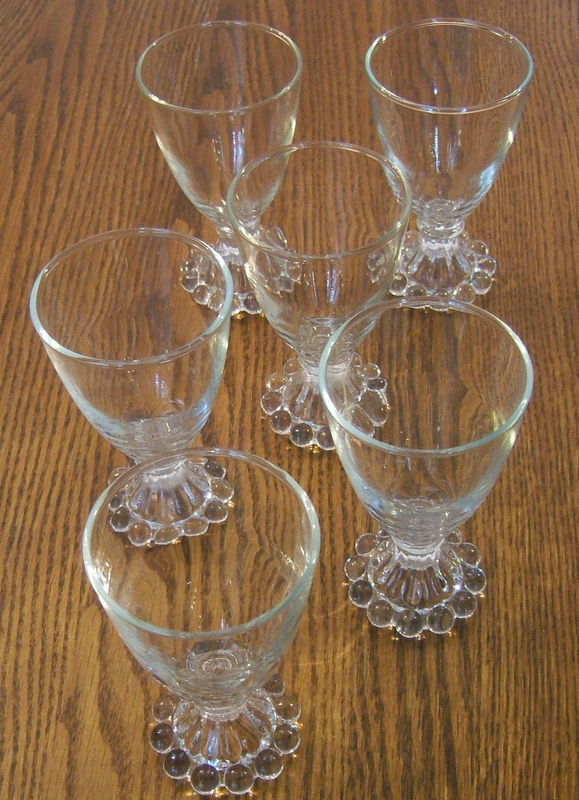 Just imagine them filled with a tempting cocktail. Next she handed me a bag with four star-shaped silver napkin rings. Each star has a different design. Love them! You can see these stars in action in my upcoming 4th of July tablescape. 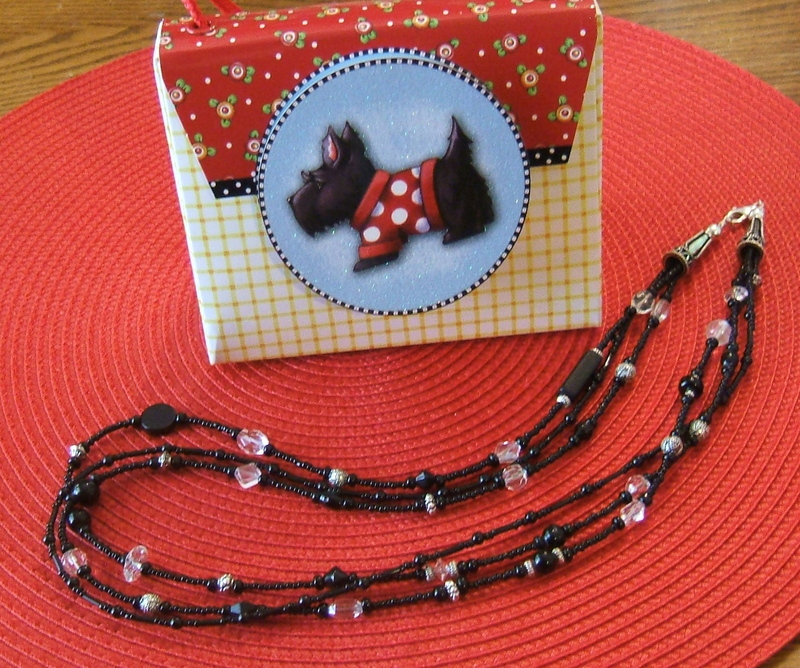 The last package was a Mary Englebreit Scottie themed bag which held a beautiful black bead necklace hand-crafted by “S”. Not only is she generous, she is talented as well. Isn’t this beautiful? I love “S”‘s beaded creations. We hit the road with plans to cross state lines in search of lunch at a fine seafood restaurant we both love and some new-to-us thrift stores. “S” treated me to a fabulous lunch of cream of crab soup and crabcake sandwich. It’s great to be the birthday girl! The next stop was a little harder to find. We were in the very busy historic downtown of a city looking for a hospital thrift shop. After locating parking in the parking garage we headed out to find this shop. Eagle-eye “S” found the donation dock for our little thrift so we knew we were in the right area. Once inside the store was quite large. “S” found a miniature teacup and saucer which will look great in some vintage display shelves she has. If we thought finding this thrift was hard, we didn’t know what was ahead of us. We followed the internet and GPS directions to the address as given. Nothing. We called the number to find that they were now at a different location. After unsuccessfully trying to locate the new shop, we had to stop for some Italian ice refreshment. Fortified again, we persevered and finally located the Salvation Army store. 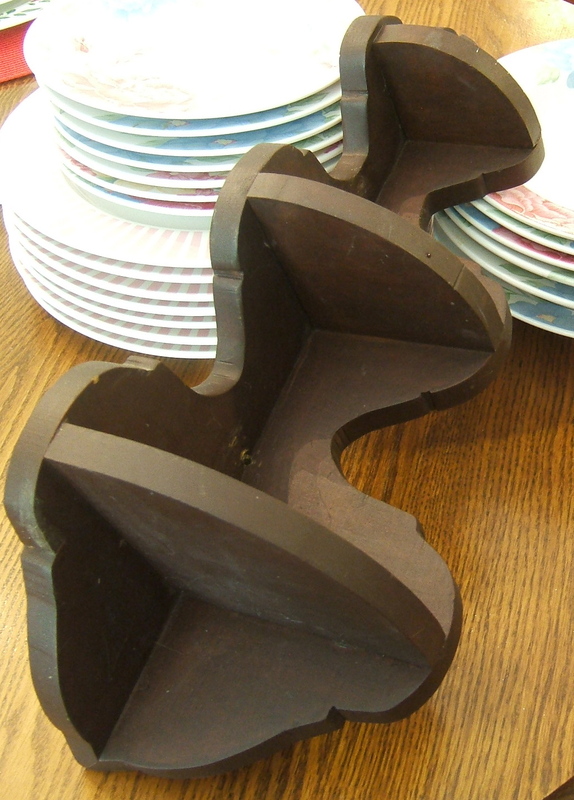 I found this corner shelf which may have been hand made. A little clean up, wood filler and maybe some paint will perk up this $1 item. 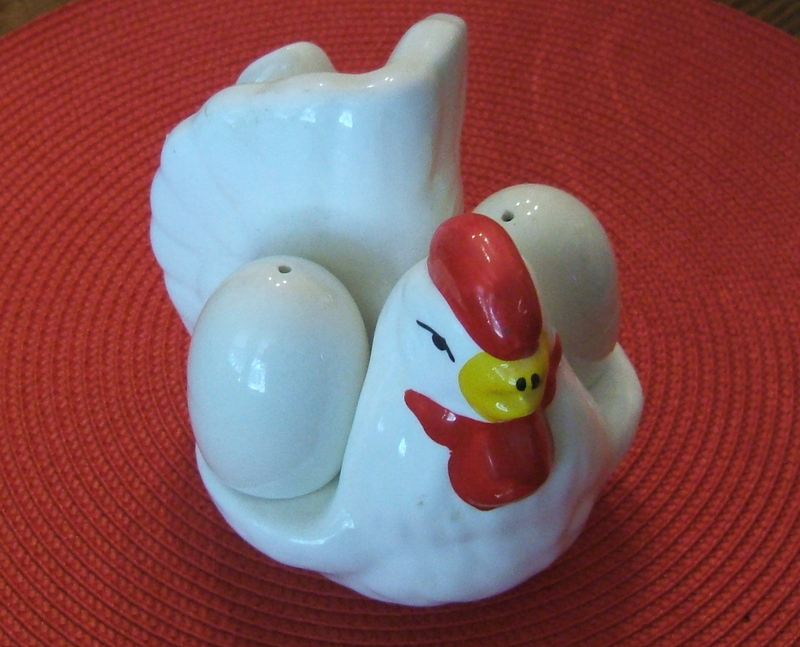 I also found this little chicken holding egg salt and peppers. How could I leave her behind when one dollar would bring her home? Our last stop of the day was a Goodwill that “S” visits often. She knew exactly how to get there so no help from the GPS was needed. We wasted no time in going right to the dish ware. I must say that I don’t like their practice of placing the prices over the bottoms of the plates. I might have bought more if I could have read makers and pattern names. 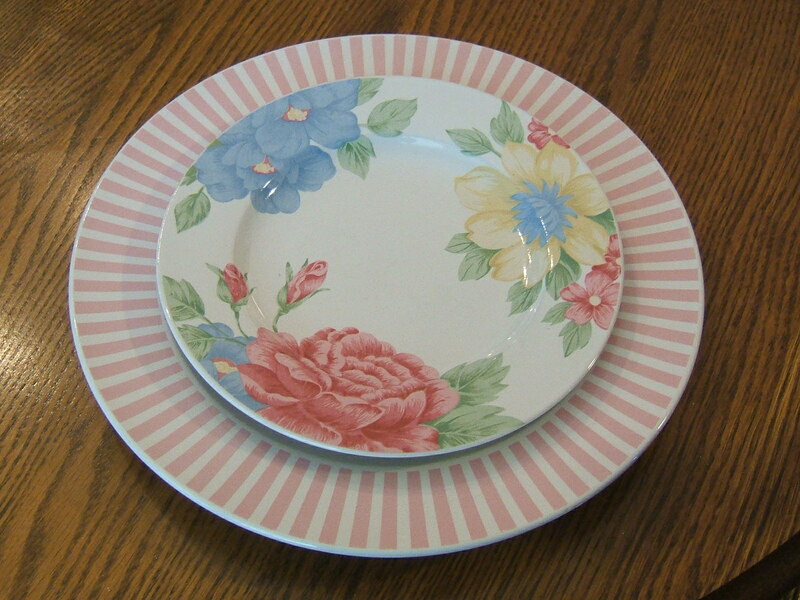 I did find seven of these dinner plates, seven of the salad plates, and at the urging of “S”, six matching bowls. Aren’t they pretty? I see a future tablescape in the making. 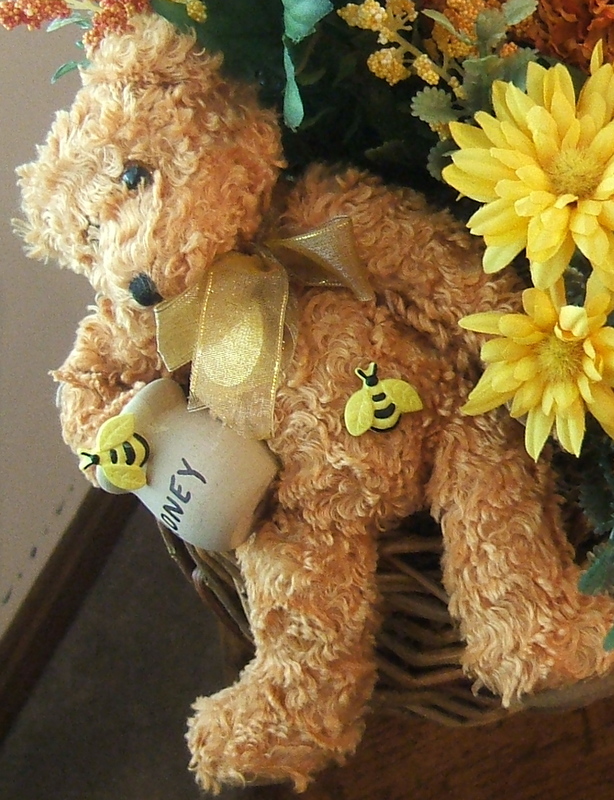 I also found a flat-backed basket filled with bright yellow flowers and a honey bear which will add a whimsical decorative touch to one of my doors. Too bad he wasn’t around for this tablescape. A birthday lunch and thrift crawl with a treasured friend is one of the best ways to celebrate another year. What fun we had! 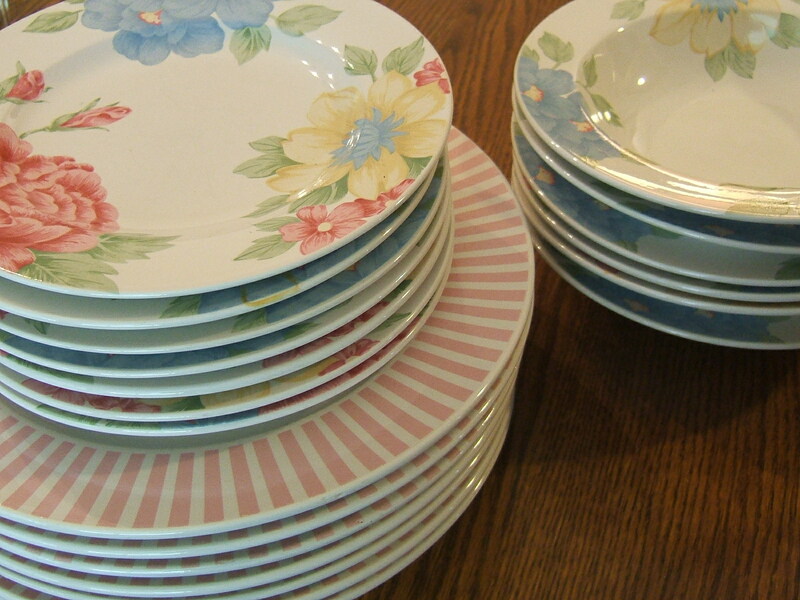 This entry was posted in Dishes, Tablescaping, Thrifting, Uncategorized. Bookmark the permalink. I can’t think of a better way to spend the day. Sounds like you and “S” had a great time. You sure did find some sweet treasures. Happy Birthday and please have a wonderful 4th. Oh I wish I could find some napkins rings like those. 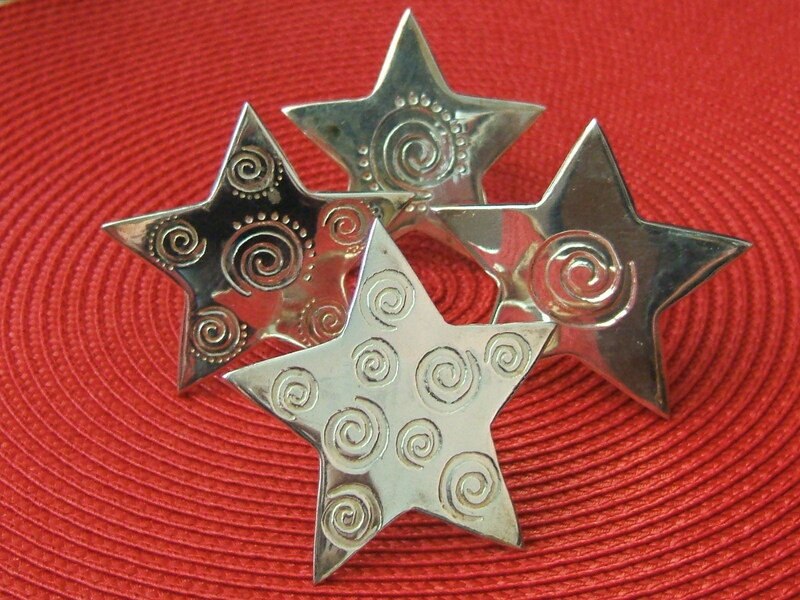 I have been looking for silver star ones everywhere….they are fantastic! Enjoy!! I love Boopie glasses so that is a wonderful gift. Looks like a lot of fun and nothing better then lunch and a thrift crawl with a friend. Happy Birthday! i found myself a truely wonderful wooden money box in the shape of a traditional beehive. in it are drilled a few unfilled holes, where plastic bees must have resided at a certain point. so. i’m a hunter for plastic bees with a little ‘foot’, that will fit the holes. three, to be exact. ps – perhaps i should properly post about this unexpected request??? As usual I read every word of the story of your adventure. You have a wonderful gift of communication and I love to read everything you write. Thanks for sharing this. Oh my gosh! What great finds!!!! I think your friend should adopt me…what a great birthday! Thanks for stopping by the blog. Definitely keep an eye out for a Silpat, they are great. The one I found on Saturday is the first I’ve ever seen at a yard sale! What beautiful dishes! I love Mary Englebreit. Don’t see much of her anymore, seems like. What a great birthday friend! Love the great treasures and your friend’s gifts are perfect. Thanks for stopping by my blog and leaving such kind words. Happy Birthday my blogger friend. Thanks for stopping by. I love hearing from bloggers. Every week is like a birthday as I go every week to my favorite thrift store. I just love those dishes you got. I can just see them on my tablescape lol.Hope you had a fun 4th. I stayed home from an invite. It was just too hot to sit in the sun. We had fireworks last night. I am only three blocks from the river where they shoot them off. It took about 1 hour for the cars going by my house so fun to watch. the dogs were very good for a change. Had to come back and wish you a happy birthday. I can’t think of a better way to celebrate. I am not a fan of GPS units but after my trying to drive and let girl friends “read” the map I may decide I have as good a chance with a mechanical voice, but probably not as many laughs. Great find Tammy! I love those dishes! And the napkin rings were a fun find. thank you for joining TTF and have a wonderful day!